The story goes like this. Many years ago Dave Thorley was mooching round in the basement of Ernest Kelly in Detroit and came across a bunch of acetates. Most of them were 10” acetates from his Geneva releases, plus a few others including a five track 12” acetate credited to Andrew Smith. Andrew is another of those unsung Detroit hero’s, a skilled drummer, who was highly regarded by his peers. He worked in later line ups of The Funk Brothers and then moved to the East Coast, when Motown went west. In his early days he played on recordings for the Four Tops, Temptations, Spinners, Marvin Gaye, Dennis Coffey and Rodriguez, such was his versatility. Once on the East Coast he played with Bob James, Yoko Ono, Hubert Laws, Eric Gale and many others. 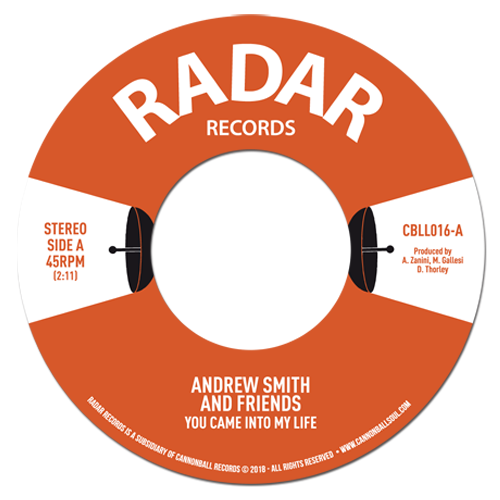 When Ernest was asked what the story was on this acetate, he said that Andrew had gone into the studio late one night with a bunch of friends and cut these tracks. Once completed he then took it to Berry Gordy with ambitions of becoming an artist in his own right, but Berry said he was better suited to being a drummer. Somewhat disheartened he gave the disc to Ernest and asked him to shop it round to see if he could get him a deal, but sadly this came to nothing and so the disc languished in the basement until Dave came across it. One problem has always been that it was very trebly, as often can be the case with acetate recordings. It much needed a restoration and remastering, which has now been done. So in a month or so time one of the gems from this acetate is to see the light of day.